Lightly coat a cooling rack with cooking spray then place on a cookie sheet or jelly roll pan. Set aside. Cut the zucchini into 3 inch sticks. Place the olive oil in a small bowl and set aside. In a separate small bowl combine the breadcrumbs, Parmesan and seasonings. Working one zucchini stick at a time, dip the stick into the olive, coat in the breadcrumb bowl then carefully place on the prepared cooling rack. Repeat with the remaining zucchini sticks. While the zucchini fries are baking, combine the mayonnaise and ketchup. 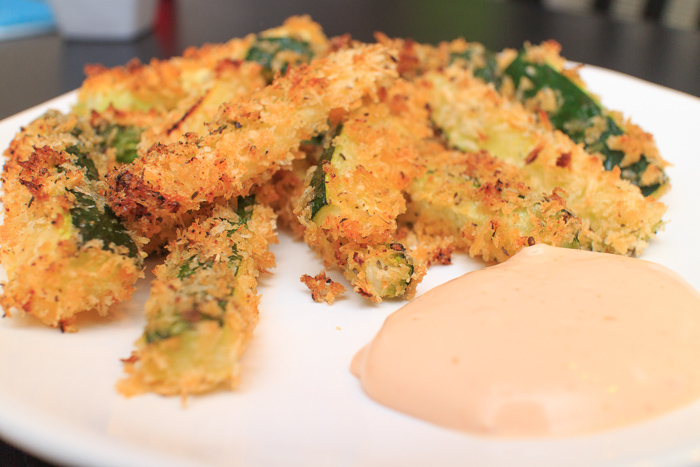 Serve the zucchini fries warm with the special sauce for dipping. Zucchini is naturally a soft vegetable when cooked so don't expect a sturdy fry, just one with flavor and an outer crunch.